This witch came from my latest series called the Wee Bits. I was playing around with that pattern the other night and this little witch was born. And she has enough modifications to make up her own pattern. I also made a green witch. I included her color codes though in the supplies list below if you want to make a green colored witch. With that being said, you can make the witch any color you'd like! You can find the link to the broom tutorial in this post. Red Heart Comfort yarn. You can use any color but I'll give you the codes for the colors I used. For the witch in the bluish dress I used Turquoise 3185 and White 3130. For her skin I used Off-White 3132. 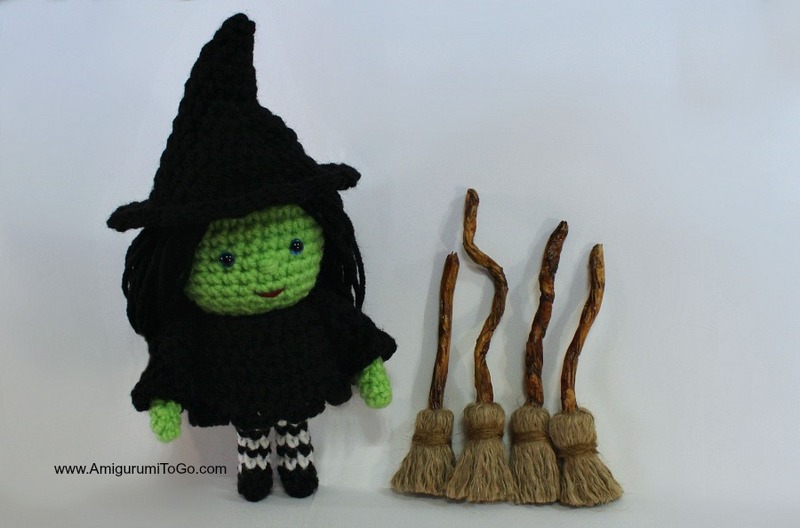 For the witch with green skin I used Melon Green 3229 and Black and White for her dress, hat and stockings. 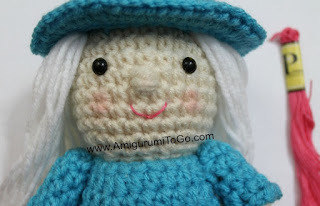 use felt, buttons, yarn or paint eyes on or use 7mm to 8mm safety eyes. Safety eyes are in between the 8th and 9th row with 5 or 6 visible stitches holes between them. Yarn eyes are wrapped around the 8th row. Please note the eyes are closer together on the green witch, those are Blue, 7.5mm and have 3 visible stitches between them. 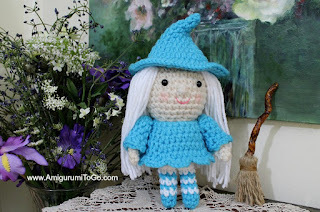 *I don't have a video tutorial for this particular doll yet but I used most of my Wee Bits pattern so if you need help at all follow along the video for that one. The head and body rows are the same between 1 and 20, it's stuffed and shaped the same. The arms are also the same and most of the face is done the same. I hope that will help you until I can get a video filmed for this one. 17-20) 1sc in each st for 4 rows *switch to white on very last st of row 20 but before you switch, stop and stuff the head. Shape while stuffing. 22) 1sc then 2tog (12) * at the end of this row break free from the body color and knot off the yarn tails. Stuff body, make sure to stuff more into the head and neck area as needed. *This next step is optional. I added an extra edge of white around as pictured. It's not that important to do, I just liked how it looked when looking from the underside of the dress and also how it flattens the bottom of the body helping the legs stand straight out . Pull white yarn through in between the last row of skin color and the first row of the white and sc around. Knot off when done and hide the yarn tails inside the body. 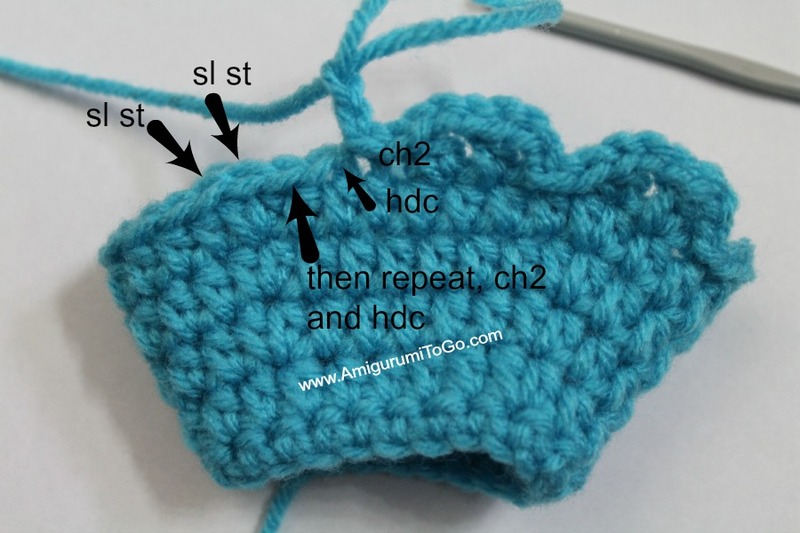 Legs: start with blue *you will be switching back and forth between colors, do not break free from either color while crocheting the leg. sl st next st and f/o leaving a long tail for sewing. Stuff just enough so the leg maintains its shape, do not over stuff. sl st next st and f/o. Hide yarn tail inside arm. Do not stuff. 5) ch 2 1hdc in next st, repeat 6 times then sl st last 2st. f/o leaving a long tail for sewing. The last 2 slip stitches that you put is the side that faces towards the dress. Push the arm into the sleeve. Use the finishing yarn tail to sew it in place, just a couple of stitches will hold it. When you put in the first stitch the yarn tail will pull the bottom of the sleeve up so make sure to pull that back in place before continuing to sew the arm inside. Once you feel the arm is secure then bring the yarn tail to the top of the sleeve, on the underside. The underside is part that will face towards the dress. sl st and f/o leaving a long tail for sewing. Weave the yarn tail up to about row 11, you'll use this to sew the hat to the head after you get the hair on the doll. The 2nd photo below shows the hat stuffed with yarn. I explain this part in the assembly section. 1) pull the dress onto the doll, make sure the little V opening is in the center of the back. You can sew the sleeves onto the dress while it's on the doll or take note where the sleeves should go and take the dress off for sewing. Whatever is easiest for you. I sewed the sleeves on while the dress was on the doll. Hide the yarn tails inside the arms. 2) Once you have the sleeves on, put the dress on the doll and sew up the V in the back. 3) Sew the legs on. Make sure the color change jumps are in the back. The jumps are very minor but it still will look better to have them in the back. You might find it easier to pin them in place first, whatever works for you. 4) make the hair. I kept this part as easy as can be. You can take more time if you want and root all the hair in but I thought since she was going to have her hat sewn in place there's no need to spend the extra time. Wrap the yarn loosely around your hand 10 times then cut through the middle at the bottom. Now take a length of yarn the same length as your stretched out bundle and tie it off in the middle, tie this part very tight. Make 7 bundles. Don't make the bundles bigger than what I've instructed here or they will be too bulky under the hat. (I borrowed the photo below from another one of my patterns). 5) sew the hair in place using one of the tie off strands. Pin the bundles on first then place the hat on top and make sure that the hair will be high enough to be covered. I guess I could have put my bundles higher, I never thought about it at the time. But you get the idea. The photo below shows 5 bundles pinned on then sewn in but I added 1 more bundle on each side in the front after I took these photos. Be sure to place the hat on before sewing to make sure it looks good. Trim the yarn to desired length after it's all sewn in. 7) add the hat. You can stuff the hat if you want. I stuffed mine with yarn the same color as the hat. Sew around the hat but don't pull the yarn tight. If you do pull too tight and part of the hat gets sucked into the head just pull it back up again. Take your time and the hat will look great! 8) add in the face details. If you haven't added eyes yet you can put in yarn eyes. Wrap yarn around the 8th row. Watch this video clip where the eyes are done the same way, wrapped around the same row with the same amount of space between them. I did a very simple nose by wrapping yarn around a stitch post horizontally, wrapping until I liked the size. When you're done bring the yarn tails out through the same stitch hole and knot off then hide the knot inside the head. The mouth is a simple strand of embroidery thread. You can also add in a bit of blush for color. I lightly rub a q-tip on blush then rub it into the cheeks. You are so awesome! I love your work.